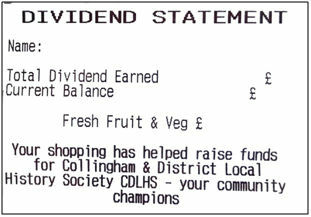 Will you sign up with the Co-op to support the Collingham and District Local History Society as your community champion? It will help us to get money from their Community Fund. The Lincolnshire Co-op has a Community Champions Fund which is distributed amongst the groups on its Community Champions Central List. The amount of money that we get will be proportional to the number of points that we acquire. This works just like your dividend. 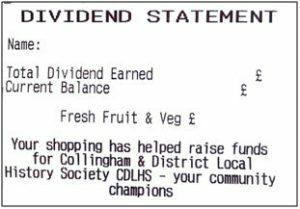 So every time you buy something from the Co-op and you hand over your Co-op card you collect your usual dividend points and we get points towards our grant. Your donation will be recognised on your receipt below your dividend points total. This is the only thing that you have to do – and only once! Please fill in the details on the form (see below). If other members of your family or friends have a card can you ask if they will fill it in too. Or you can go online to Lincolnshire Co-op Community Champions and follow the steps for ‘Choose my own Community Champion’. … even if there is only one entry as every sign up will help! You can only sign up to support one organisation. If you sign up to support a second organisation then the earlier one will be cancelled. Please print and fill in the application form (pdf). Then return the completed form to us or hand it to a Co-op cashier.